Created in the wake of World War I, the Council on Foreign Relations came of age after World War II and amid the Cold War. 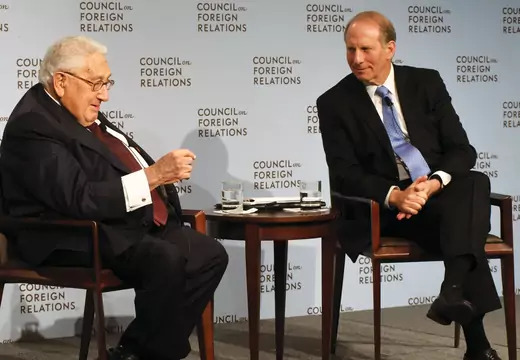 The focus of much of CFR’s activities during those four decades was major power relations and, above all, the highly competitive and dangerous relationship between the United States and the Soviet Union. Meetings, scholarship, and the pages of Foreign Affairs were often devoted to debates over how to protect and advance U.S. interests in a manner that did not lead to direct confrontation with a nuclear-armed rival. Work on relations between and among major powers remains essential, but it is by no means sufficient. New actors, forces, and technologies are shaping international relations as never before, and American foreign policy has changed, reflecting new challenges, concerns, and priorities. One result is that CFR’s agenda, too, has evolved to ensure it can fulfill its mission of remaining a resource that is relevant for its members, elected and appointed officials, the media, corporate leaders, students and teachers, and congregational and religious leaders. Cyberspace is a prime example of a topic that barely existed a generation ago and that now occupies a large place on CFR’s intellectual agenda. In some ways, the challenge posed by cyber technology is reminiscent of that presented by nuclear weapons in the 1940s and 1950s. Then, as now, a new technology had burst onto the world scene, and in both cases this technology had the potential to do considerable good or great harm. In certain ways, the policy challenges posed by cyberrelated technologies and the Internet are even greater than those posed by nuclear weapons in light of the many actors—individuals, groups, and governments—who can enter the fray. But what remains consistent is the need to create a set of rules, institutions, and policies that will encourage behaviors deemed desirable and discourage those judged not. This in a nutshell is the objective of CFR’s digital and cyberspace policy program. Global health is another subject now receiving considerable attention at CFR, and for good reason. Infectious diseases, including but hardly limited to HIV/AIDS and Ebola, are a major threat not just to individuals but to entire societies; moreover, what may begin as a local outbreak can quickly become a threat to people everywhere, given the modern transportation systems intrinsic to globalization. Devising national and international policies and mechanisms for preventing and limiting outbreaks of infectious disease is an obvious need, one reflected in the work of several senior fellows who are part of CFR’s global health program. A related issue of growing importance is noncommunicable diseases (NCDs), including diabetes, heart disease, and various forms of cancer often caused by excessive alcohol consumption, poor diet, inadequate exercise, and smoking. Such diseases receive much less attention and far less in the way of resources from governments and global agencies, but in some aspects they constitute an even greater problem for rich and poor countries alike. It was for this reason that in 2014 CFR sponsored an Independent Task Force on NCDs. Energy and climate change make for a third set of issues that received little attention a generation ago but that now figure prominently in both the international agenda and in U.S. foreign policy. The recent transformation of the U.S. energy position along with the potential of new technologies has far-reaching ramifications for the environment and U.S. national security alike. This set of issues is at the heart of research being carried out by fellows in CFR’s program on energy security and climate change. Energy and climate change are examples of issues that are not narrowly political or military or economic. In fact, such issues, including sanctions and trade, cross disciplinary boundaries. It is for this reason that the Maurice R. Greenberg Center for Geoeconomic Studies was created at CFR more than a decade ago. What these and other issues also have in common is that they are both local and global. The United States cannot on its own meet such challenges; it needs the active support of other governments as well as regional and global institutions, nongovernmental organizations, and corporations. This is the logic that led to the creation of CFR’s International Institutions and Global Governance (IIGG) program. One important element of IIGG is the Council of Councils, a network of some two dozen policy-oriented think tanks from countries in every region of the world. The group meets several times a year to consider what more countries might do to combat challenges that affect all of them. This past year, the Council of Councils issued the first of what will be annual report cards assessing the world’s performance in tackling such challenges as preventing conflict between and within states, terrorism, proliferation, and migration. The focus of the Council on Foreign Relations cannot be limited to the foreign policy of the United States or others. Conflict remains central to international relations and the work of the Council on Foreign Relations. CFR’s Center for Preventive Action promotes strategies to prevent, mitigate, or resolve violent conflict around the world. The center’s annual Preventive Priorities Survey of experts and officials assesses likely or existing conflicts and their potential impact on the United States. Its signature product, the Global Conflict Tracker, is an interactive online guide that provides information on actual or potential conflicts, including in Libya, Syria, Iraq, and North Korea. But the focus of the Council on Foreign Relations cannot be limited to the foreign policy of the United States or others. CFR’s Civil Society, Markets, and Democracy program examines the economic, political, and social dynamics that are critical to the spread of democratic values and sustainable, inclusive development around the world. An example of the program’s work is the Women and Foreign Policy program, which considers the status of women an issue tightly bound to other international priorities, including public health, security, and development. A related point can be made about national security—namely that it, too, must transcend foreign policy. The United States’ continued ability to find the human, economic, and military resources to project power abroad and to set an example other countries will want to emulate will depend in no small part on how well it does at home. Immigration policy, infrastructure modernization, quality of education, deficits and debts— all will affect American competitiveness and ability to lead. Such issues are at the heart of CFR’s Renewing America initiative, now entering its fourth year. As I trust is clear, CFR’s activities and research have evolved significantly over the years in order to reflect new international realities and contribute to new domestic debates. What has not changed, however, is our commitment to serving as a resource for policymakers, the public, and our members through timely, authoritative, policy-relevant work, and we will continue to evolve as needed to ensure this resource stays of the highest value. CFR is a premier destination for the most influential voices in foreign policy and international relations. Known across the country and around the world as a unique forum for informed, serious, and both on- and off-the-record exchanges, it remains the venue of choice for leaders of government, business, and academia. This past year, beginning with the UN General Assembly in September, CFR hosted dozens of foreign officials and heads of state. The most pressing issues were addressed by those most closely affected by them: Prime Minister Arseniy Yatsenyuk of Ukraine on Russia’s annexation of Crimea; President Fuad Masum of Iraq on efforts to combat the self-proclaimed Islamic State; and Foreign Minister Javad Zarif of Iran on the nuclear talks with the United States, other members of the UN Security Council, and Germany. Newly elected heads of state, including Afghan President Ashraf Ghani and Indian Prime Minister Narendra Modi, chose CFR as the platform through which to reach the U.S. foreign policy community. And leaders including Japanese Prime Minister Shinzo Abe, President of the Kurdistan Region of Iraq Masoud Barzani, Mexican President Enrique Peña Nieto, and Italian Prime Minister Matteo Renzi spoke on the issues dominating their national agendas. Henry A. Kissinger, with President Richard N. Haass, reflects on the Cold War at a symposium to mark the twenty-fifth anniversary of the fall of the Berlin Wall. CFR also hosted an impressive number of high-ranking U.S. officials this year, including Secretary of the Treasury Jacob J. Lew, Secretary of Homeland Security Jeh Charles Johnson, and Secretary of Energy Ernest J. Moniz. CIA Director John O. Brennan and other agency heads addressed the membership, as did a number of members of Congress. Defense officials, among them Navy Secretary Ray Mabus, Pacific Fleet Commander Harry B. Harris Jr., and all five military service chiefs (including Joseph F. Dunford Jr., chairman-elect of the Joint Chiefs of Staff) shared their views on U.S. strategy and the United States’ position in the world. As conflicts escalated in Ukraine, Syria, and Iraq, and as West Africa faced the largest Ebola outbreak in history, CFR convened meetings and teleconferences to inform members, the public, and the media. The What to Do About ... series, in which meetings take the form of National Security Council sessions with speakers acting as counselors to the president, brought panels of experts together to propose and defend solutions to some of the world’s most vexing problems, including the Islamic State, Iraq, and the Israeli-Palestinian peace process. Other series provided analysis on a broad range of subjects, from influential personalities (Power Profiles) to the policy impact of innovations in technology (Emerging Technologies). The CEO Speaker series brought Michael S. Dell of Dell Inc., Ellen J. Kullman of DuPont, and James P. Gorman of Morgan Stanley to CFR. Conferences and symposia focused on topics such as humanitarian intervention and the end of the Cold War, the latter of which featured a keynote address by former Secretary of State Henry A. Kissinger. On economics, former Federal Reserve Chairman Alan Greenspan and current Vice Chairman Stanley Fischer deliberated over trade, currency, and global trends, as did central bankers and finance ministers from Germany, Ukraine, and England. International officials, including International Monetary Fund Managing Director Christine Lagarde, World Bank President Jim Yong Kim, former Executive Chairman of the UN Monitoring, Verification, and Inspection Commission Hans Blix, and UN Undersecretary-General for Humanitarian Affairs Valerie Amos, offered their perspectives on issues of global governance. The National Program provides multiple avenues for members who live outside of New York and Washington to connect with CFR and its resources. More than one hundred National meetings were convened this year in more than a dozen cities. The program also organized a monthly Conference Call series on subjects ranging from corruption in Mexico to the shift in U.S.-Cuba relations, and it offered virtual access to nearly 130 events in New York and Washington. Trips to Atlanta and the San Francisco Bay Area introduced National members to Centers for Disease Control and Prevention Director Thomas Frieden, former Secretary of State George P. Shultz, San Francisco Mayor Ed Lee, and executives at Google, Salesforce, Uber, and Palantir Technologies. 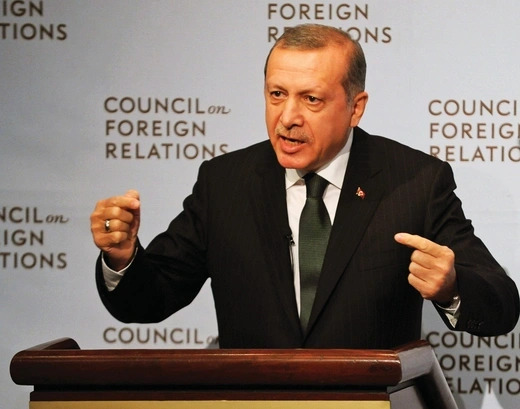 Turkish President Recep Tayyip Erdoğan explains his plan to combat the self-proclaimed Islamic State and outlines the Turkish approach to regional security. The twentieth annual National Conference featured two and a half days of meetings and events in New York. The conference opened with an address by U.S. Secretary of Health and Human Services Sylvia Mathews Burwell and offered sessions on climate change, the geoeconomics of oil and gas, and efforts to counter violent extremism. U.S. Trade Representative Michael Froman participated in a dinner conversation with CFR President Richard Haass that assessed the U.S. trade agenda. Jami Miscik, former deputy director for intelligence at the CIA, led a special session of the What to Do About … series on North Korea, featuring Burwell B. Bell III, former commander of U.S. forces in the Republic of Korea, and Christopher R. Hill, former ambassador to the Republic of Korea and head of the U.S. delegation to the Six Party Talks on the North Korean nuclear issue. Tom Brokaw moderated a discussion between Assistant Secretary of State Anne C. Richard and International Rescue Committee CEO David Miliband on the humanitarian challenges presented by displaced people and refugees. Former Undersecretary of State R. Nicholas Burns led an overview of the foreign policy challenges facing the United States that featured Representative of the United States to the African Union Reuben E. Brigety II, former Assistant Secretary of Defense Mary Beth Long, and former NATO Supreme Allied Commander James G. Stavridis. CFR’s more than 160 Corporate member companies represent a broad range of industries and are a vital source of insight and support. This year, CFR welcomed thirteen new member companies: the Abraaj Group; Colliers International; DNB Bank ASA; Fitch Ratings; Fluor Corporation; Generali; Glenview Capital Management; KPMG LLP; Newmont Mining Corporation; Noble Energy, Inc.; Thomson Reuters; United Technologies Corporation; and Wells Fargo. In addition, Morgan Stanley and Shell Oil Company upgraded to the top corporate membership tier (Founders), while Zurich upgraded its membership to the President’s Circle level. The program’s Senior Executives Breakfast series brought business leaders together for informal policy discussions. Meetings in New York and Washington featured Senior Fellows Adam Segal and Robert K. Knake on cybersecurity, Elizabeth C. Economy on China, Sebastian Mallaby on the global economy, Alyssa Ayres on the U.S.-India relationship, Steven A. Cook and Ray Takeyh on developments in the Middle East, and James M. Lindsay on U.S. politics and foreign policy. This year’s Corporate Conference opened with a conversation between Turkish Prime Minister Ahmet Davutoğlu and CFR President Richard Haass and included plenary sessions on the global economy with former Treasury Secretary and CFR Co-Chairman Robert E. Rubin and former International Monetary Fund Chief Economist Kenneth Rogoff; geopolitical risk with Richard Haass and CNN’s Fareed Zakaria; and emerging technologies and cyber governance with CFR Senior Fellow Adam Segal and Craig Mundie, former head of research at Microsoft. CFR’s scholars published more than sixty papers, reports, and essays on subjects ranging from economics and security to public health and climate change. They also authored four new books. On the complex politics of East Asia, Senior Fellow Sheila A. Smith’s Intimate Rivals: Japanese Domestic Politics and a Rising China explored the effect of Japan’s internal political dynamics on its relationship with China. The Japan–South Korea Identity Clash: East Asian Security and the United States, by Senior Fellow Scott A. Snyder and Brad Glosserman, executive director of the Pacific Forum at the Center for Strategic and International Studies, looked at the ways that national identity has complicated relations between Japan and South Korea. On energy and economics, Adjunct Fellow Blake Clayton’s Market Madness: A Century of Oil Panics, Crises, and Crashes debunked the conventional wisdom on shrinking oil supplies. And Ashley’s War: The Untold Story of a Team of Women Soldiers on the Special Ops Battlefield, by Senior Fellow Gayle Tzemach Lemmon, told the story of a team of female soldiers serving alongside special operations forces in Afghanistan. In a first for CFR, the book rights for Ashley’s War have been optioned for a feature film. In addition, Senior Fellow Laurie Garrett released an ebook, Ebola: Story of an Outbreak, which recounts the 1995 Ebola outbreak in Zaire. Experts devoted considerable attention to conflicts around the world. In December, the Center for Preventive Action released its annual Preventive Priorities Survey and an accompanying online interactive, the Global Conflict Tracker. The survey aims to help policymakers assess competing priorities in conflict prevention. In his report “Defeating ISIS,” Senior Fellow Max Boot urged the United States to intensify air strikes in Syria and Iraq while fostering partnerships with local and regional powers. Senior Fellow John Campbell, former U.S. ambassador to Nigeria, authored U.S. Policy to Counter Nigeria’s Boko Haram, in which he advocated cooperating with the Nigerian government to root out sources of extremist support and promote human rights across the country. Also focusing on the country is the Africa program’s Nigeria Security Tracker, which maps violence perpetrated by a number of groups, including Boko Haram. Two reports focused on strategies to curb regional unrest: “Political Instability in Zimbabwe,” by George F. Ward, coordinator of the Africa program at the Institute for Defense Analyses, proposed ways for the United States to foster stability in a post-Mugabe Zimbabwe; and “Political Crisis in Venezuela,” by Patrick Duddy, director of Duke University’s Center for Latin American and Caribbean Studies, was updated to reflect rising dysfunction and public frustration in Venezuela. 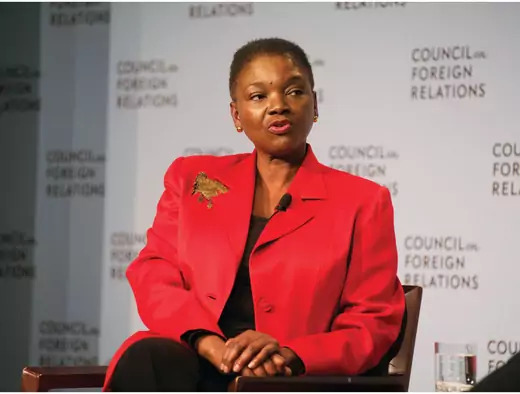 Valerie Amos, UN undersecretary-general and emergency relief coordinator, shares her perspective on today’s most pressing humanitarian challenges at the Sorensen Distinguished Lecture on the United Nations. Amid plans to rebalance U.S. foreign policy toward Asia, a number of CFR experts focused on Washington’s strategy in the region. “Breaking the Stalemate in U.S.-ROK Nuclear Cooperation Negotiations,” by Senior Fellow Scott Snyder, recommended a path to resolve the damaging impasse that has arisen between the two countries on whether South Korea can enrich and reprocess nuclear fuel from the United States. Japan’s New Politics and the U.S.-Japan Alliance, a report by Senior Fellow Sheila Smith, detailed how more-competitive elections are affecting Japan’s relationship with the United States. “Conflict in the South China Sea,” a report by Bonnie S. Glaser, senior advisor for Asia at the Center for Strategic and International Studies, offered suggestions to lower the risk of conflict, particularly military incidents between U.S. and Chinese armed forces. And Revising U.S. Grand Strategy Toward China, a report by Senior Fellow Robert D. Blackwill and Ashley J. Tellis, senior associate at the Carnegie Endowment for International Peace, forecasts decades of intensifying competition between Washington and Beijing and recommends that the United States de-emphasize efforts to integrate China into regional and global arrangements and instead focus on limiting its influence. On economic questions, the timely report “A Paris Club for Europe,” by Senior Fellow Robert Kahn, encouraged the development of a functional, rules-based approach to European debt relief. In response to fluctuating energy markets, Senior Fellows Michael A. Levi and Shannon K. O’Neil authored a working paper, “Spillovers From Falling Oil Prices: Risks to Mexico and the United States,” with Alexandra Mahler-Haug, a research analyst at NewWorld Capital Group, LLC, that highlighted Mexico’s vulnerability to weak energy markets and the effect that has on the United States. In “Rare Earth Elements and National Security,” Eugene Gholz, an associate professor at the University of Texas at Austin, analyzed China’s presence in the rare earth markets in the context of the economic and national security of the United States. The think tank also debuted a new interactive that constitutes the first effort to build a complete database of the world’s central bank currency swap arrangements—little understood cross-border tools of financial crisis management. The think tank welcomed eleven new fellows this year—scholars and practitioners with diverse backgrounds and a range of experience: Willem H. Buiter, chief economist at Citigroup, to work on macroeconomics and globalization; David P. Fidler, professor of law and senior fellow at the Center for Applied Cybersecurity Research at Indiana University, to examine how international law applies to cyberspace; Philip Gordon, former assistant secretary of state for European and Eurasian affairs and White House coordinator for the Middle East, to write on the Middle East and Europe; Bernard Gwertzman, former editor in chief of the New York Times online, to write a memoir; Jennifer M. Harris, former member of the secretary of state’s policy planning staff, to assess the use of economic statecraft for geopolitical ends; Miles Kahler, a former fellow who returns to the Studies Program to focus on issues of global governance; Robert Knake, former director for cybersecurity policy at the National Security Council, to work on innovations in cybersecurity; Farah Pandith, former special representative to Muslim communities for the State Department, to explore strategies to counter violent extremism; Senator John D. Rockefeller IV, former chairman of the Senate Select Committee on Intelligence, to work on Japan, East Asia, and cybersecurity; Kenneth Rogoff, former chief economist at the International Monetary Fund, to work on international economics; and Varun Sivaram, former senior associate at McKinsey & Company, to study the impact of transformative energy technologies on the global economy and geopolitics. In 2012, CFR launched the Council of Councils (CoC), an international network of think tanks and research institutions that encourages conversation and consensus building among thought leaders from around the world. Composed of more than two dozen policy institutes mostly representing G20 countries, the CoC focuses on global governance. Coinciding with the group’s annual U.S. meeting, held this year at CFR’s office in Washington, the CoC released its inaugural Report Card on International Cooperation. The Report Card, derived from a survey of experts from CoC member institutions, evaluates progress in ten critical areas, ranging from preventing war within and between countries to promoting global cooperation on climate change, health, and cyberspace. The Independent Task Force Program convenes experts from across the political spectrum to provide findings and policy recommendations intended to influence policymakers and shape public dialogue on every subject as well as on issues where consensus has been elusive. The Independent Task Force on Noncommunicable Diseases (NCDs), chaired by former Indiana Governor Mitchell E. Daniels Jr. and former National Security Advisor Thomas E. Donilon and directed by Senior Fellow Thomas J. Bollyky, was the first convened by CFR to examine a global health issue. The group’s final report, The Emerging Global Health Crisis: Noncommunicable Diseases in Low- and Middle-Income Countries, analyzed NCDs as a threat to national security and international economic development. The Independent Task Force on North America, chaired by General David H. Petraeus and former World Bank President Robert Zoellick and directed by Senior Fellow Shannon O’Neil, issued its report, North America: Time for a New Focus, which offered recommendations to enhance the continent’s competitiveness by deepening ties among the United States, Mexico, and Canada. A new Task Force, launched this spring and chaired by former Harvard Kennedy School Dean Joseph R. Nye Jr. and Warburg Pincus CEO Charles Kaye and directed by Senior Fellow Alyssa Ayres, will examine India’s foreign and domestic policies as well as U.S.-India relations. The Academic Outreach Initiative connects students with CFR research and programming and provides professors with teaching tools to facilitate a deeper understanding of international issues in their classrooms. Resources, including classroom guides and the monthly Academic Bulletin newsletter, help teachers and professors introduce complex policy topics to their students, while dedicated events and in-depth briefings provide a forum for the academic community to interact with CFR experts. This year, through the Academic Conference Call series, CFR fellows briefed professors and students on issues ranging from Ebola to U.S.-China relations. More than three hundred students and professors attended the initiative’s annual Back-to-School Event for a screening of CFR.org’s InfoGuide “The Sunni-Shia Divide” and a panel discussion on the Middle East featuring NPR International Correspondent Deborah Amos and Dean of Johns Hopkins University’s Paul H. Nitze School of Advanced International Studies Vali Nasr. Education is an increasing priority for CFR, and this year the organization formed a dedicated Education department. Now in its fourth year, the annual College and University Educators Workshop brought more than one hundred professors from three countries and thirty-one states, including representatives from public, private, and community colleges, to CFR for conversations on pressing international concerns with experts and policymakers. The High School Educators Workshop, designed for high school teachers from the Northeast, featured discussions on global issues and teaching methods. In the annual meeting of the Higher Education Working Group, college and university presidents and foundation representatives shared their perspectives on challenges facing higher education in a rapidly changing world. The group’s most recent gathering featured sessions led by University of California President Janet Napolitano and former Yale University President Rick Levin. Education is an increasing priority for CFR, and this year the organization formed a dedicated Education department to focus on developing original content and products for university and high school students and their instructors to help prepare the next generation of citizens for the challenges of a complex world. The curriculum will focus on issues central to international relations and U.S. foreign policy as well as on building skills such as critical thinking and effective speaking and writing. CFR is a rare source of nonpartisan analysis for members of Congress and government officials. CFR experts have been called to testify thirteen times before the 114th Congress since its inauguration in January. The Congress and U.S. Foreign Policy Program arranged meetings with CFR fellows and more than one hundred congressional offices. It also conducted regular meetings for officials from the State Department, the National Security Council, and the Defense Department and held quarterly briefings for members of the intelligence community, while the Diplomatic Program convened meetings with the ambassadors from Belgium, the European Union, Germany, Japan, Mexico, and Nigeria. The biennial Congressional Staff Conference, which attracts hundreds of participants, featured CFR members and fellows who led sessions on the Islamic State, Ukraine, fiscal policy, and trade. More than 120 participants, ranging from policymakers to congregational leaders, attended the Religion and Foreign Policy Workshop. The Religion and Foreign Policy Initiative connects communities of faith with CFR work and serves as a forum for cross-denominational discussion of international issues. Programming highlights this year included a small roundtable with Bechara Boutros al-Rahi, the patriarch of Lebanon, that focused on the future of Christians in the Middle East; meetings on repression in North Korea, discrimination in Uganda, and the role of social media in conflict resolution; and conference calls on subjects ranging from U.S. immigration policy to the intersection of free speech and religious freedom. 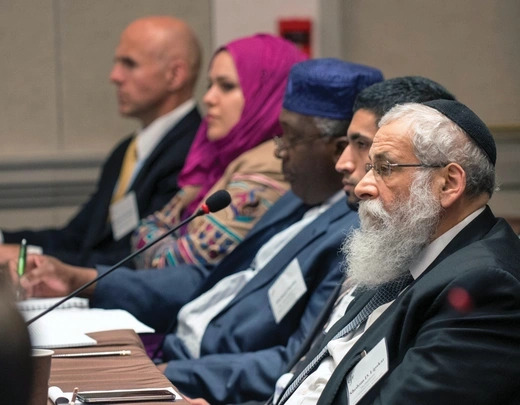 In May, the ninth annual Religion and Foreign Policy Workshop gathered representatives from thirty faiths at CFR’s New York headquarters for two days of discussion on topics including climate change and the role of religion in peace-building. In the span of several years, CFR.org has grown into a core component of the organization’s efforts to educate the public on international issues. This year, as major developments unfolded abroad, CFR.org’s editorial team provided breaking analysis on the Ebola epidemic, Hong Kong’s protests, nuclear talks with Iran, violence in the Middle East, U.S.-Cuba relations, and the crisis in Ukraine. Most recently, CFR.org hosted essays, interviews, and an interactive timeline and guide on the Greek financial crisis. The website is also home to dozens of videos and interactives, including the three latest installments of the award-winning InfoGuide Series. “The Sunni-Shia Divide,” “The Time of the Kurds,” and “The Taliban” all combine accessible reporting with compelling multimedia elements. The website hosts a library of nearly one hundred Backgrounders on issues ranging from U.S. trade policy to Europe’s migration crisis. With the recent addition of Net Politics, which tracks digital policy and cyber security issues, CFR.org is now home to sixteen expert blogs. CFR’s overall online presence has grown significantly: on each of it’s main social media channels—Twitter, Facebook, and YouTube—the organization’s following has more than doubled over the past year.